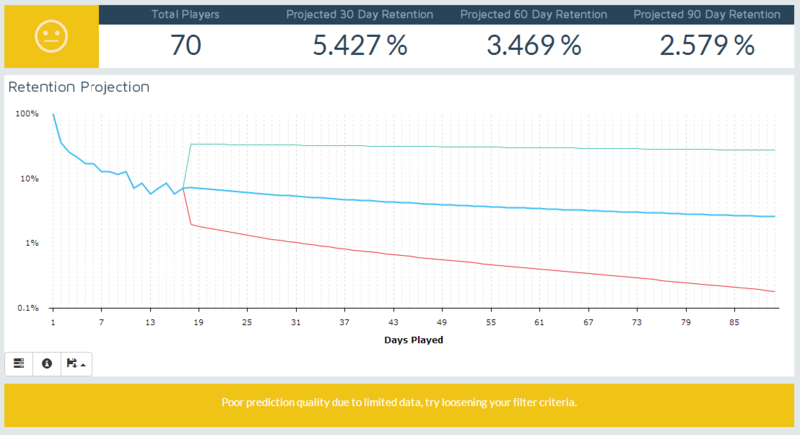 The retention optimizer tool allows you to determine how many players will still be playing your game over a 90 day period, and to filter and segment those players to identify which characteristics are associated with engaged players. To use the retention optimizer, begin by filtering your player base to isolate the player start dates, demographic filters and segments you wish to analyse. It is important to carefully consider your choice of player start dates. 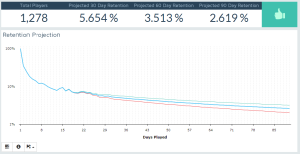 The retention optimizer estimates the retention in a 90 day window from the player start date i.e. the day a player installs is Day 0 and the estimate will be calculated from this day to 90 days in the future. If all the player start dates are more than 90 days ago then the retention optimizer will work exclusively with actual playing data. If some, or all, of the player start dates are less than 90 days ago a prediction will be made to fill the gap between today and Day 90. In the case where only a fraction of the player start dates are less than 90 days ago, the prediction will be based on the weighted combination of actual data, and predicted values, with the weighting equal to the actual number of installs that occurred on each date. Once you have chosen the player start dates, filters and segments you wish to analyse hit the UPDATE button to run the retention optimizer tool. This tool returns a value bar and a chart to summarise the results. 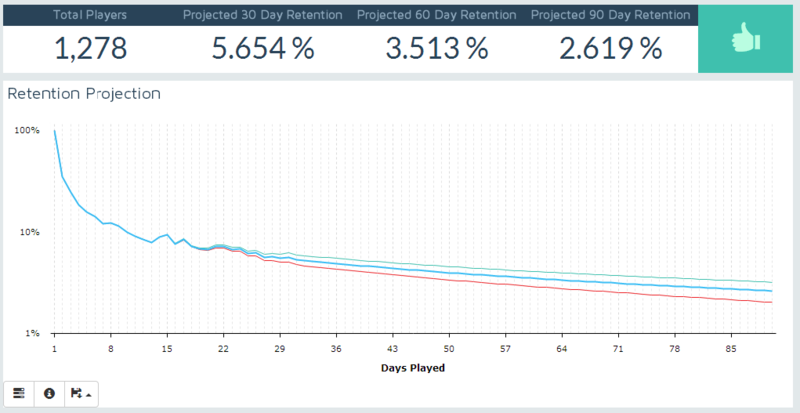 The Retention Projection chart shows the projected retention (i.e. % of players that are playing) at each of the Days Played. The blue line shows the best estimate of the retention, while the green and red lines show the maximum and minimum value, respectively, within which that the retention could fall. The type of retention we report is the classic day N retention based on UTC days. This means a user is considered retained if they play are active on the Nth day after the date of their first event.